Farmers struggled through very desperate times. The conditions were so bad that Tim Flannery, now Australia’s Chief Climate Commissioner, declared that cities such as Brisbane would never again have dam-filling rains. Rather bizarrely, in 2007 he stated that hotter soils meant that “even the rain that falls isn’t actually going to fill our dams and river systems”. Fast forward to 2012 and we see widespread drenching rains, flooded towns and cities, and dams full to the brim and overtopping. Indeed, the rainfall that we had last year not only filled Brisbane City’s Wivenhoe Dam water supply storage, but also all of its flood mitigation capacity. The resultant releases of water required to prevent a truly catastrophic dam failure contributed to the inundation of large parts of metropolitan Brisbane. How is it that Tim Flannery could have got it so spectacularly wrong? The most obvious factor could well be Flannery’s lack of background in a climate science. He is an academic, however his background is mammalogy – he studied the evolution of mammals. Flannery obviously has a great interest in climate change and no doubt has read some of the scientific literature and no doubts consults with other climate commissioners. I have no doubt either that he by and large understands what he reads. The one thing he cannot do without a solid education in climate science is critique what he reads; without the background surely he cannot perceive the underlying and often unstated assumptions associated with what he reads or is told. He is perhaps best described as an amateur enthusiast, in which case I could actually have a little sympathy for him for getting it so wrong. As I speak, the comments are pretty fair, much to my amazement. A step in the right direction – towards sensible dialogue. I think Franks was way too lenient on Flannery. i think the funniest thing he has done is support geothermal which imploded soon after, then said that houses on the seaside were going to be ruined by rising seas then bought a house right on the water. It’s just a shame we’re paying Tim $180,000 a year, for 3 days ‘work’ a week, to get things soooooo wrong. Even Flanneryland is held up by the rain! What did Flim Flammery say about Warragamba and Sydney’s water shortage? Now we’re drowning in the stuff. The sky is falling, the sky is falling…………we’re all doomed! When I arrived in this amazing country four years ago…I foolishly assumed that the ABC was an impartial media organization and was deeply dismayed by it’s daily (nay hourly) offerings of eco-doom and despair. my favourite being “The Murray Darling River System is finished.” etc etc ad nauseam. What was even more nauseating was the gushing gratitude with which the ABC journalists (I use the term loosely) accepted the words of their guru. I think most Warmists today are in that rather odd position that the followers of US Doomsday Cults find themselves in quite regularly…yes it must be quite strange packing up to go back home…the day after the world has ended! Not any more. The faithful contend that Flannery was misquoted and suprise, suprise Franks is a denier. Flannery and the Dept of Hot Air should be tied to the Warragamba spillway. Their salaries would pay for our mothballed desalination plant. I dont think the de-sal plant can be mothballed, that’s the big problem it must be operated at a nominal throughput at great cost to the NSW taxpayer. I don’t know, Simon. I think the censorship panel is going to have to shut down all this reasonableness. But Tim Flannery has himself created the public wisdom he is a bit of a joke,not only for his dud predictions ,but also for his actions and contradictions of some of his ill-thought out prognostications..
Tim Flanney’s comments prove “There really is a Gaia”. But it would appear Tim Flannery is not his chosen messiah ! Remember how 60 Minutes whipped up the “permanent drought” scare in 2005? CHARLES WOOLEY: While many farmers believe that drought is just part of a natural cycle, scientist Dr Tim Flannery sees much broader and more sinister forces at work. We live in a new world where global warming and climate change now have Australia on the edge of permanent drought. PROFESSOR TIM FLANNERY: We are in by far the worst position of any country that I’ve had a look at in terms of climate change. CHARLES WOOLEY: The worst of any country? 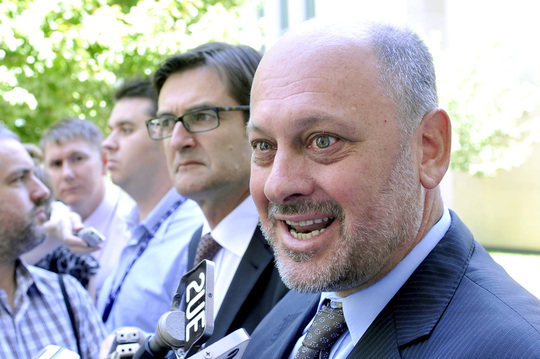 PROFESSOR TIM FLANNERY: Yes. When you look right across the continent, what has happened is that the winter rainfall zone that has been the heart and soul of the bread basket of Australia is declining. The amount of rainfall through winter is declining. On the east coast of Australia we have a parallel effect where we are getting these El Ninos back to back. We’re getting one drought after the other and eastern Australia is suffering from that. So put together, you have the continent from Perth through to Brisbane suffering severe water deficits. CHARLES WOOLEY: If Tim Flannery is right, the new weather regime has southern Australia drying out permanently. See also Stewart Franks dissing Flannery in today’s Australian.